I promised you all pictures, so here they are. A little serendipity goes a long way....Here in the Trenches. The International Olympic Committee has decided that wrestling, one of the oldest sports in the modern Olympics, should no longer be a core event. Wow. That decision has left most of us who know wrestling absolutely speechless. Wrestling is the embodiment of the Olympic tradition. It is a test of man against man, where strategy, as much as strength determines the winner. Wrestling teaches discipline, the power of hard work, civility and responsibility. Anyone can wrestle: it requires no expensive equipment, just a mat and a partner. I'll be clear here - I'm a wrestling mom. My son wrestled through high school, and now he's a high school wrestling coach. I go to all the meets. It's an interesting perspective being the mother of the coach, as I watch the meets not only to cheer the young people on, but also to see what kind of effect my son has had on them, and how they relate to each other. Because of the nature of the sport, the coach has a huge influence on them. I've watched as the young men progress from being unable to plan their next move on the mat without the coaches telling them what to do and how to do it, to confident wrestlers who anticipate the next move of their opponent and plan for it with minimal help of the coach. They are disciplined and hard working (or they won't last long on my son's team). These young men learn respect for themselves and for their opponents - you will rarely, if ever, see a wrestler who doesn't shake the hand of his opponent and his opponent's coach after a match. Those who don't are quickly corrected by their coach and their teammates. Last weekend was the county tournament, and the wrestlers went out on the mat and gave it their all against their opponents, and around the gym wrestlers from different schools and the same weight class sat together laughing after they finished wrestling. One of my son's wrestlers from last year had changed school districts, and after he wrestled, my son congratulated him. Coaches from different school horsed around together. Funny, now that I'm writing this, it reminds me of the family law community here in the Trenches. New lawyers have little idea what they're doing, and they need more experienced lawyers to lead them every step of the way. After we've been practicing for a while, we can handle cases by ourselves, although all of us need a little help and coaching now and again from our peers and mentors. These same people who help us are our opponents in the courtroom, and we fight like hell in the courtroom against each other. Then, afterward we shake hands with our opponent and their client. Maybe later, we share a laugh together. After watching the wrestlers, I wonder why how we act with each other in the Trenches is so hard for our clients to understand. After all, it's just good sportsmanship. What's wrong with acting civilized - here in the Trenches. Sometimes life takes you down different paths. Whether those paths are positive or negative is how you view it. Is it an arduous hike or a bit of a rocky climb to a fabulous view? When I started working here in the Trenches, all of my work was traditional litigation and advocacy. Then, I learned mediation. Then, collaboration. Then, parent coordination. Still, the majority of my practice was traditional litigation and advocacy. Sure, I applied all my new skills to my cases, and that helped lots of cases settle, but still the majority of my work was not the alternative dispute mechanisms I love. A lot of the reason for that was that the other attorney and other client weren't on board with it, so I did what I could to make a purse out of a sow's ear. I never doubted my journey would end up where I wanted it to go, I just wasn't sure when. I kind of felt like some of my collaborative clients - it takes so long to ask the questions that we need to ask and gather the information to answer them, that they wonder if we will ever reach conclusion. Usually right about then, everything usually falls into place, and presto, the case settles. So it has been with my journey. All of a sudden, along with my regular litigation cases, I have a mediation or two, a couple of parent coordination cases, a new collaborative case coming in the door, and I'm teaching law school school. All of that hard work, all of those years of training finally translate into the diversified work I envisioned. Just like my collaborative clients. Here in the Trenches. Happy Valentine's Day from the Trenches. Truth be told, it's not my favorite holiday. Expectations are high and unrealistic, to start. What to give and to whom? Just to lovers, or to parents, children and friends? Is a store bought card sufficient, or will only a handmade one do? One rose or a dozen? When all is said and done, I'm not really sure what is said and done. Love isn't about grand gestures one time a year. It is all the little things you do the other 364 days. It's making the coffee, taking the car in for repair, attending a wrestling meet when you don't understand wrestling. It's chicken soup when you're sick, it's laughing at jokes that aren't funny, it's taking the kids out so mom or dad can have time to themselves. All of those things are love. If the love isn't there the other 364 days, then cards and roses and chocolates don't mean much. Then we'll see you - Here in the Trenches. Today, I made another visit to my favorite running store, Potomac River Running in Rockville. You heard about Joe here, last May. Chris is also awesome. Anyway, the princess and the pea of running shoes is back. Running shoe companies don't know when to leave well enough alone. Saucony redesigned my favorite running shoe and made it narrower in the toe. Really? Did they think their size 7.5s were going to thank them for that? Anyway, I digress. I ended up having to buy an 8 wide, after careful consultation with Chris about whether to switch shoe companies and styles. I've been running in the shoes for two months and doing pretty well. Until, that is, I increased my mileage. Suddenly, toward the end of long runs, my toe would tingle and become numb and my knee would lock. Are you kidding me? 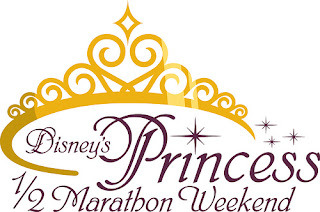 Two weeks before the Princess Half Marathon? I went back to see Chris for help. We discussed whether it could be the shoe. Could my foot be sliding inside? We discussed my stride. 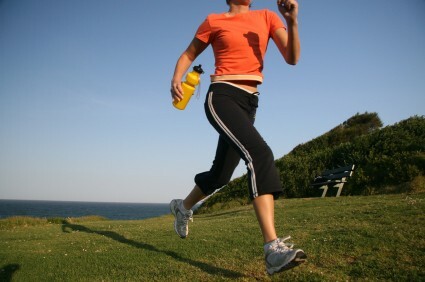 Could I be getting tired toward the end of the run and changing how I run? We thought a bit more, and then Chris said that maybe my foot was swelling after 9 or 10 miles and becoming cramped inside the shoe, which was then too small for my foot. That would explain the tingling toe and the change in my stride. We decided to try a different sock. Yes, you heard me: after half an hour in the store and of Chris's time, I bought I pair of socks. A different sock, one that is thinner but with more support. That way, I have room in the shoe for my foot to swell without jamming my toe, and my arches get a little TLC as well. It's a plan and it's what I needed. What I love about Joe and Chris is that they're not just selling me a shoe, or socks or running clothes. They really care that I enjoy my running, and they work with me as a team to make that happen. I feel supported and that my concerns are heard when I visit them at the store. I'm hopeful that we can find a solution to any running problem I might have, and even if we can't, it won't be for lack of effort. My experience with Chris and Joe is what I hope my clients experience here in the Trenches. They all have problems that most of them don't understand. They need to make sense of what is going on in their lives. They have disconnected facts and need help to make them into a story that makes sense. They need help solving their problem. Sure, they need legal expertise and a guide through the legal process, but even more than that, they need someone to care, to listen and to support them as they move through a difficult part of their lives. It's our job, just like Chris and Joe, to listen to our clients and help them find a solution. Sometimes the solution is simple, and sometimes it's not. Sometime's the solution is not what our clients want to hear. Even then, it can be OK, so long as our clients know that they matter to us and that we are committed to help them. Good thing that's what we do - Here in the Trenches. There are two types of people in the world. I know you're thinking I'm going to say something like optimists and pessimists, and in some ways, I am. The two types of people are those who want to know what's wrong and how to fix it, and those who are afraid to find out. You might call them something else, but that's how I see them, and this is my blog, so.....The former want to know what you're doing. They want to know how they can help. Then, they help, sometimes too much. The latter? Well, they stick their heads in the sand. When you try to pull them out, they fight you. They think of every possible reason why they can't do what you ask, why it just won't work. They put more energy into being obstinate than they would have used just giving what you asked a try. I know you won't be surprised that I prefer the former here in the Trenches. I would much rather have a client who is too proactive, who is constantly thinking about new angles and new arguments (and calling and emailing me about them), than one who argues against everything. Both clients argue with me; one is challenging and invigorating, and one is exhausting. I can only hope the ostrich client pulls himself out of the sand and decides to help, rather than hinder, their case. Some of them do, but for most of them, it's just how they are. Frustrating. Here in the Trenches. Is There A Reason For Everything? Some of you may be tired of this series on grief and loss, but that's what's on my mind. I was having lunch with my son on Saturday (after his wrestling team's victory that put them at 11-2 for the season - go High Point! ), and we were talking about our mutual friend, Office T. Son was saying that he was a little annoyed with the priest at the funeral, because of his stated view that everything happens for a reason, and that whatever happens is G-ds will. It bothered my son, because how can anyone think there's a reason for the death of a 22 year old? I can't say I disagree with him on that one. I can't think of a greater purpose behind ending a life before it's really had a chance to start, or say, of taking away the father of two small children. I can't think that a benevolent G-d would want that to happen. I also don't think that's exactly what the priest meant. Horrible things happen, and they seem to happen to really good people. When we say that things happen for a reason, I don't think we're talking about Office T or my friend's husband dying from cancer. I think we're talking about what happens to the rest of us because those people are in our lives. We could curl up in a ball and pray the world goes away. Most of us don't do that, at least not for long. I think about Office T and my friend's husband, and I think of how they brought us all together. Our love for them was our original commonality, but what we found as time went on was a community. We depended, and still depend, on each other. We shared the good and the bad, and the really bad. We quietly bore witness and supported each other in our grief. We helped each other move on. Office T and my friend's husband faced their diseases with a dignity and a strength that shamed us and made us want to emulate. They reminded all of us that life is too short to gripe and do nothing. They inspired us to....whimsy, to try something new, to not be so careful and afraid. Otherwise, their lives and deaths would have had no meaning at all. So we give it a meaning and a reason. What about the Trenches? 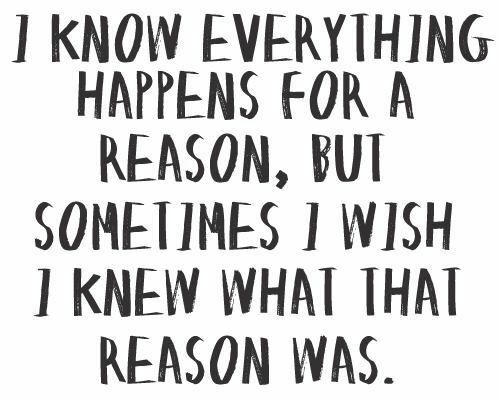 Well, everything happens for a reason. The reason is what you make of what happens to you. Did the end of your marriage force you to think about the type of person to whom you are attracted? Did it make you do something about it, or did you do nothing and made the same mistake again? Did the end of your marriage make you think hard about the kind of life you'd been living and inspire you to do something else? Did your custody fight make you think about the kind of parent you want to be, and become that parent? I'm sure you lost friends and part of your community in your divorce, but did you seek out others? Did they support and inspire you? In other words, did this unpleasant and unhappy event create change in your life besides the obvious loss. Was there a positive that came from the negative, or just a negative? Did it happen for a reason? Only you know. Here in the Trenches. Since the beginning of the new year, I note that I have not been as faithful a correspondent as I would like. For that, I apologize. Sometimes, new and important things and experiences take up more time than you expect, and the time has to come from somewhere. Take teaching collaborative divorce at the University of Maryland School of Law, for example. I always wanted to teach law school, and when Suzy Eckstein arranged with Jana Singer for this opportunity, I jumped at the chance. Then, I learned what my brother in law and my son, the teachers, always said - it takes at least 6 hours to prepare for every 3 hour class. On top of that, teaching in Baltimore on Friday morning means that I can't count on being back in the office until 2:30 or 3:00 on Friday afternoon. Kind of shoots the whole day in the foot. Through the end of April, I have only 4 days a week in the office. I don't regret it, it's something I always wanted to do, but it does cause some stress. Then, of course, there's wrestling season for the high school team my son coaches. Again, as I've said in earlier posts, wrestling is something my son and I share, and that's important. Wrestling meets are, however, at 5:30 or 6:00 in the afternoon, and the meets are usually about an hour away from the office, so again, I have to leave work early. It's important enough that it's worthwhile, so I deal with it. How come most of wrestling is in January and February? Oh yes, it's a winter sport. The regular season ended yesterday, so that's a bit of time I can now spend back in the office. 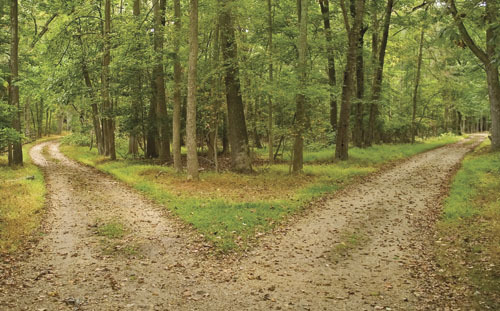 Sometimes, life gives you choices and you have to make them. My choice is to write less right now. Sorry, but there has to be some time to help clients - Here in the Trenches.